1. 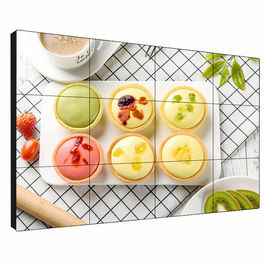 Pure flat panel display, LCD is the representative of flat panel display equipment, is a true flat panel display, no curvature and large picture distortion. 2. Thanks to the color calibration technology specially developed for DID products, besides the color calibration for static pictures, the color calibration for dynamic pictures can also be carried out. Only in this way can we ensure the accuracy and stability of the picture output. In terms of color saturation, DID can achieve 80% - 92% of high color saturation, while the current color saturation of CRT is only about 50%. 3. The brightness is uniform and the image is stable and does not flicker. Because each point of LCD keeps that color and brightness after receiving the signal, it does not need to refresh the pixel points as CRT does. Therefore, LCD has uniform brightness, high quality and absolutely no flicker. 4.120HZ frequency doubling refresh frequency, the 120Hz frequency doubling liquid crystal display technology of DID products can effectively solve the trailing and blurring in the process of image fast motion, enhance the clarity and contrast of the image, make the picture clearer, and the human eye is not easy to fatigue for a long time. 5. The visual angle is broader. Using this technology, the visual angle can reach double 180 degrees (horizontal and vertical). The application of PVA technology, i.e. image vertical adjustment technology, makes the LCD splicing screen have a broader visual angle. 6. High brightness and contrast: DID LCD splicing screen has higher brightness, which is different from ordinary TV and PC LCD screen. 7. Super thin and narrow edge design, LCD splicing screen not only has the characteristics of super large display area, but also has the advantages of super light and thin. It can be easily spliced and installed. The special LCD screen for splicing has excellent narrow edge design, so that the edge of the single chip is even less than 1 cm, so the small edge effect will not affect the overall display effect of the whole display screen. 8. 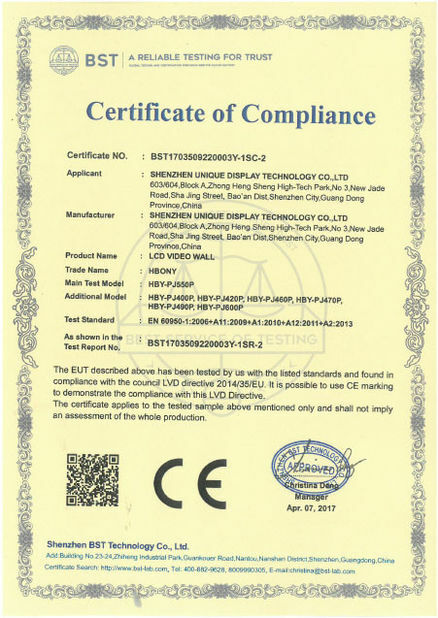 Reliability is better, ordinary LCD screen for TV, PC display design does not support day and night continuous use. ID LCD screen is designed for monitoring center and display center. It supports continuous use in 7x24 hours. 9. With long service life, the service life of the backlight of DID LCD screen can reach more than 5-100,000 hours. 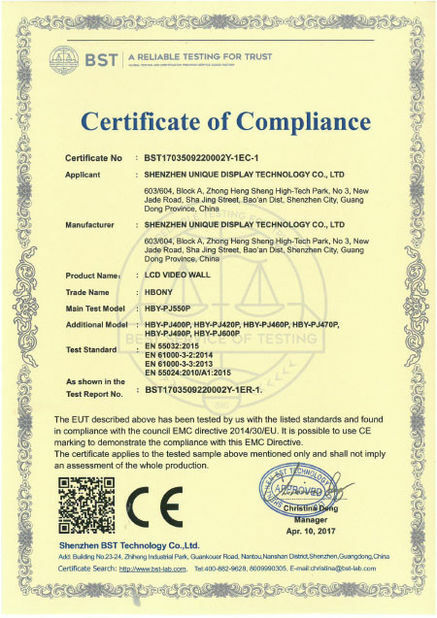 This ensures the consistency of brightness, contrast and chroma of each LCD panel used for splicing display screen after long use, and ensures that the service life of the display screen is not less than 60,000 hours. 1) We have strong R-D team,which ensures our own technological and innoative design for customers! Our tech team has many years experience in LCD commerical display, we are global professional large screen display system solution provider. The panels we adopt are 100% LG and Samsung original, which can ensure that 1 years warranty. Products go through strict examination before exporting. Process like careful raw material examination, aging, debugging, etc. 1year for screen,3 years for PC parts and labor. 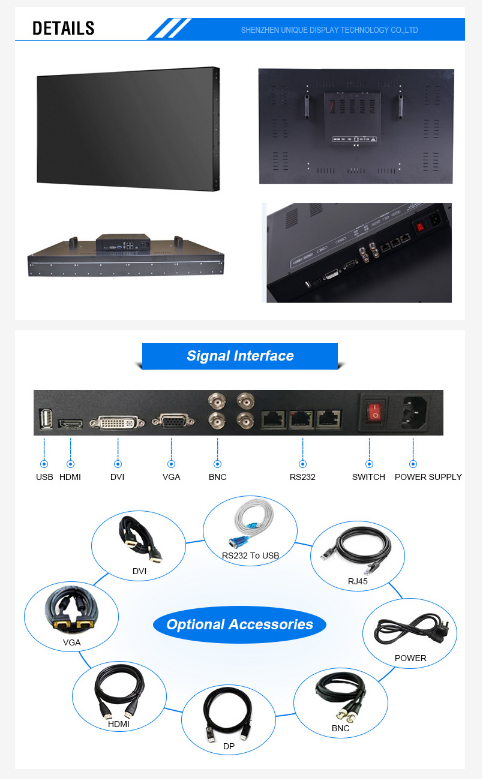 Within warranty period, if under proper usage,we will replace for free after technician examine the faulty product, also we provide repair service only charge components cost. We have good shipping partners,DHL/UPS/China air lines/Cosco,which can guarantee the fast and safe delivery.